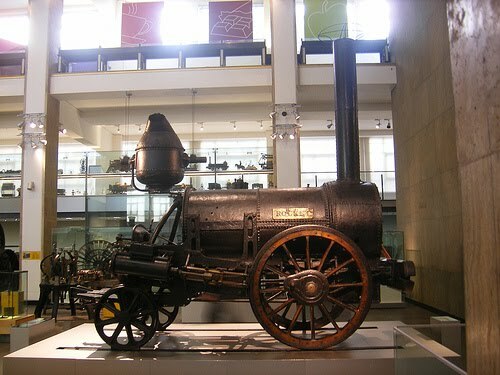 Billed as the most famous steam locomotive in the world, Stevenson's Rocket was the first modern steam locomotive, built in Stephenson's Newcastle Upon Tyne the Forth Street Works in 1829. The original Rocket can still be seen on display in the 'Making the Modern World' gallery at the Science Museum. Considering the Rocket fatally hit a Member of Parliament, William Huskisson, MP for Liverpool and a keen supporter of railway building, on its opening day, by running over his leg, it seems amazing by today's standards that the Rocket wasn't scrapped, but it continued with adjustments until 1840. Saw this recently at the Science Museum. It took me back how small the locomotive was. I always assumed it would be this huge engine. For those into engineering and trains this is a must see exhibition.